"Bad News for the Bad Guys: The F-14 is still in the game!" On 29 April 1975, Commander Task Force 76 received the order to execute Operation Frequent Wind, the evacuation of U.S. personnel and Vietnamese who might suffer as a result of their past service to the allied effort. Later that day, many evacuees had been cleared from the U.S. Defense Attache Office and the U.S. Embassy. This aerial exodus was paralleled by an outgoing tide of junks, sampans, and small craft of all types bearing a large number of the fleeing population. On the afternoon of 30 April, Task Force 76 moved away from the coast. This ended the U.S. Navy's role in the 25-year American effort to aid the Republic of Vietnam in its fight for survival. Moammar Gadhafi, leader of Libya, extended the territorial claims over the Medirannean Sea to twelve nautical miles instead of the international accepted 2 miles. Playing the role of the "World Wide Police Force" the US started a challenge against the Libyan leaders' territorial policy: US aircraft carrier battle groups exercised close to the Libyan twelve mile zone while US Navy fighters often entered the Libyan "territorial waters". Often US Navy aircraft were tracked by Libyan radar and Libyan fighter aircraft were launched against US fighter aircraft, heading in their direction and turning away before coming into too short range. 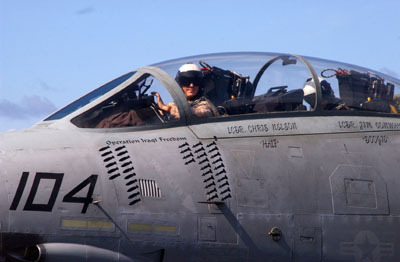 But sometimes it came to air combat maneuvering missions between Libyan and US Navy aircraft. The morning of 19 August 1981 began for two patrolling VF-41 F-14As just the same way: Fast Eagle 102 and Fast Eagle 107 were flying Combat Air Patrol (CAP) mission for USS Nimitz (CVN-68) aircraft conducting a missile exercise. A patrolling E-2A Hawkeye made radar contact with two Libyan Sukhoi Su-22 Fitters which had taken off from the former Wheelus Air Force Base near Tripoli and were now heading towards the VF-41 F-14s. As the Fitters were closing in on the Tomcats, the lead Su-22 pilot fired an AA-2 Atoll air-to-air missile at the F-14s. The missile failed, the Su-22s were declaired hostile and the Tomcats were cleared to engage. The lead F-14 went for the Fitter wingman while the other went for the Su-22 leader. Soon thereafter, when the Su-22 turned clear of the sun of the lead F-14 pilot got a lock-on with an AIM-9 Sidewinder missile and fired, hitting the Su-22's tailpipe. The Libyan pilot ejected successfully from his burning Fitter. Meanwhile, the second F-14 fired on his lead Fitter at very close range an AIM-9 air-to-air missile and destroyed the Su-22. The F-14 and its crew had proven itself superior to the Su-22s. The day is January 4, 1989. The airspace close to the Libyan coast. Two VF-32 F-14As from USS John F. Kennedy (CV-67) fly a mission as Combat Air Patrol when a pair of Libyan Mikoyan-Gurevich MiG-23 Floggers were detected. 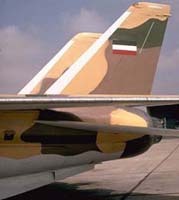 The MiG-23s had taken off from Al Bumbaw Airfield near Tobruk and they continued their flight towards the US fighters, even though the F-14s radar had locked on the bogeys. It's a common procedure under such circumstances to lock the powerful AWG-9 radar on the incoming Libyan fighters, to give them the possibility to turn around and head back home. Usually this procedure was impressive enough to drive the Libyans back since the radar warning tone resulting from an armed F-14's radar was fearsome enough. But this time it did not work. 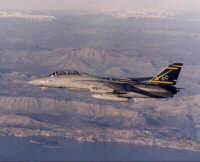 For the second time US Navy F-14s were engaged by Libyan fighter aircraft under hostile conditions. During the 8 minutes engagement, the MiGs kept turning in on the Tomcats to maintain a firing solution for their Soviet built air-to-air missiles. As later examination of F-14 still photography resolved, the MiG-23s were armed with AA-7 Apex missiles. After several evasive maneuvers by the Tomcats and aggressive maneuvers by the Floggers, the incoming pair of MiG-23s were declared hostile and the F-14 crews were cleared to engage. The crew of the lead F-14A, AC202 (BuNo. 159437) fired an unsuccessful AIM-7 Sparrow missile, while the second F-14As, AC207 (BuNo. 159610) AIM-7 found its target and destroyed one MiG-23. Thereafter, the lead F-14 closed in on the remaining MiG-23 and launched an AIM-9 Sidewinder heat-seaking missile. The missile exploded in the tailpipe of the fleeing Flogger. The pilot of this MiG-23 also managed to eject from his destroyed aircraft. Both pilots were seen with good chutes. After this engagement, the victorious Tomcats headed north for the carrier. "Navy Four, Libya Zero"
In 1983 a multi-national peacekeeping force - including some 800 U.S. Marines - did their duty in Lebanon, a country shaken by civil war. In late 1983 the peacekeeping force was threatened by both Lebanese military groups and Syrian forces, resulting in combat mission by aircraft from CVW-3 aboard USS John F. Kennedy. During these missions, VF-11 and VF-31 F-14A were under fire from Syrian Surface-to-Air missiles (SAM) and Anti-Aircraft-Artillery (AAA). VF-11 even engaged MiGs over Lebanon. 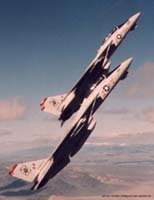 One of the aircrews: "While assigned to VF-11, I engaged eight MiGs over Lebanon. I was the CAP for this mission and flew 3,000 feet above the TARPS F-14 on the run over Lebanon. My section engaged 4 MiGs. I locked on and prepared to shoot. Four MiGs did a split S and ran for Syria. Four more MiGs came in to shoot us but blew through without engaging." None of the F-14s were losts or damaged, but the Syrians' aggressive action resulted in the National Command Authority ordering air strikes against Syrian positions near Hammana. During the attacks, two U.S. Navy aircraft were shot down, one A-7 and one A-6. The A-6 pilot was killed, the B/N taken prisoner (and released a few weeks later) and the A-7 pilot ejected safely and was recovered by friendly forces. On 22 September 1980 Iraqi troops invaded Iran to occupy the region of the Schatt Al Arab and some strategic islands in the Persian Gulf. These areas in Iran include some rich oil fields. When the NATO decided to intervene in the war in what was once known as Yugoslavia, fighter aircraft from various NATO countries flew reconnaissance and combat missions. The U.S. Navy aircraft carriers with CVW-8 onboard were on station in the Adriatic Sea. 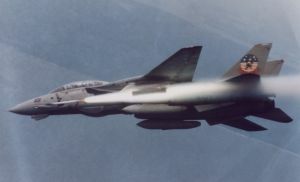 In support of the IFOR and SFOR troops in former Yugoslavia, F-14s from several squadrons flew multi-role missions: Air-to-ground strikes against hostile targets (CAS, Close Air Support), Forward Air Control (FAC(A)) and TARPS missions. In this conflict the Tomcats delivered life laser-guided bombs for the first time for real. Also, flying from U.S. carriers, the F-14 represented the only U.S. photo reconnaissance aircraft in the Adriatic (except for the unmanned recce drones). Kosovo Crisis: In March 1999, NATO decided to strike against Serbian forces due to continuing ethnic expulsion and massacres against the Albanian people in Kosovo. To end Yugoslavian terror NATO bombed Serbia for weeks day and night. The US send among others the aircraft carrier USS Theodore Roosevelt which also ment launching F-14s. The role of the F-14s was enemy fighter suppression, forward air control, aerial reconnaissance and also precision laser-guided air-to-ground attacks. When airstrikes ended, the role of the allied fighters was changed to fly cover for the international KFOR troops who occupied Kosovo. 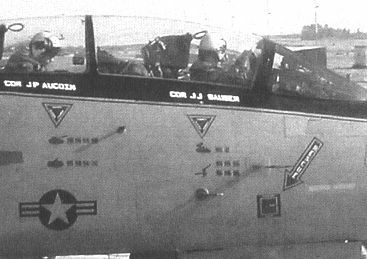 Between 06 April and 09 June, CVW-8 fighters flew 4,270 total sorties and 3,055 combat sorties with zero losses. The F-14s, EA-6Bs and F/A-18s of CVW-8 destroyed or damaged a total of 477 tactical targets and 88 fixed targets. Among others, VF-14 F-14s dropped some 350 laser-guided bombs (a total of 350,000 lbs) and the Tophatters flew also FAC(A) missions for other coalition strike aircraft. On September 11, 2001, terrorists attacked the USA with hijacked airliners which they used as flying bombs. 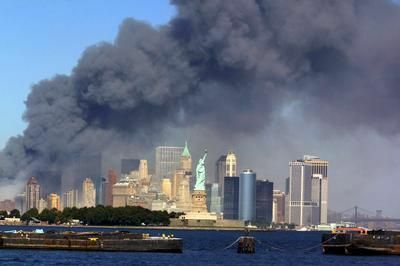 The unthinkable happened when the terrorists directed two airliners into the New York City World Trade Center towers, killing thousands of innocent people and damaging both towers so badly that both collapsed shortly thereafter. At the same time, another airliner was flown into the Pentagon in Washington, D.C.. Hundreds of people inside the building were killed, too. In a fourth airliner near Pittsburg, hijackers were heroically stopped by passengers when they fought against the terrorists onboard the flying airliner. However, this aircraft crashed killing all people onboard. The primary target of the terrorists, to crash the airliner into another city, failed. Several thousand people were killed onboard the aircraft, in the buildings or on the streets around the buildings. Never before in modern history has such a terrorist act happened before. The whole world was shocked. On Sept. 12, 2001 NATO implemented Article 5, which stated that an attack against a member in Europe or North America was an attack against them all. The terrorists were identified as being a group around the Arab Osama Bin Ladin, living in Afghanistan under the protection of the ruling Taliban regime. In their fight against terrorism the USA were joined by all nations of the world (except Afghanistan and Iraq) - no matter what the country's religious orientation is. Weeks after the terrorist attacks, U.S. and British forces started a major series of strikes to battle the terrorists and their network, their infrastructure and weapons. On Oct. 7, 2002 aircraft carriers (CVN-65 with VF-14 & CVN-70 with VF-213) launched long-range, heavy loaded F-14 and medium-range F/A-18 strike fighters day and night while the Air Force sent long-range bombers deep into Afghanistan. Targets were terrorist bases, weapons and vehicles, training camps and Taliban military units. Additionally, the attacks were placed as a front-line pace maker for the so called "Northern Alliance". This group of anti-Taliban Afghans moved from northern Afghanistan down south in their long lasting fight against the Taliban regime. As in any war, the attacks caused also civilian casualties among the Afghan population, but as far as it is known these were limited to a small number. On Oct. 9, 2002 VF-14 led the first long-range tactical air strike, flying over 1,700 miles round trip to Mazar-e Sharif, where Taliban aircraft were destroyed on the ground. Numerous strikes with precision guided ammunition followed from VF-14, VF-41, VF-102, VF-211 and VF-213. The fight against world-wide terrorism has only just begun and the world faces a long period of insecurity until international terrororism is overcome. Since Gulf War II the Iraqi government played games with the UN inspectors and failed to fully disarm and destroy the weapons as told by UN resolutions. This lasted for 12 years and nobody really seemed to care. In March 2003, the USA decided it was enough and went to war with Iraq without a UN resolution. F-14 Tomcats took part in the war as part of several Carrier Air Wings. The deputy commander of CVW-41 (USS Abraham Lincoln) stated, that even with the arrival of the F/A-18E, the F-14 remains "the platform of choice for precision targeting." 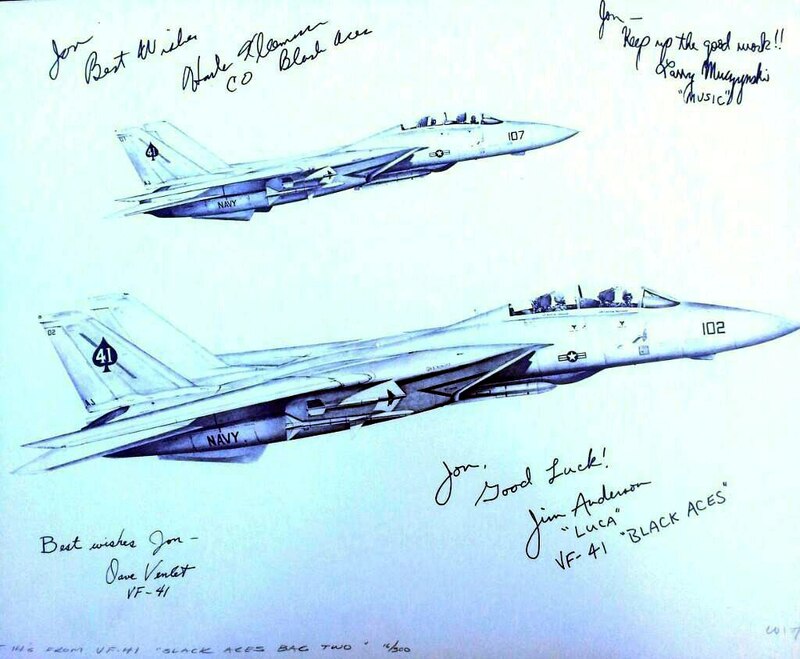 Five F-14 squadrons participated: VF-2, VF-31, VF-32, VF-211 and VF-213.